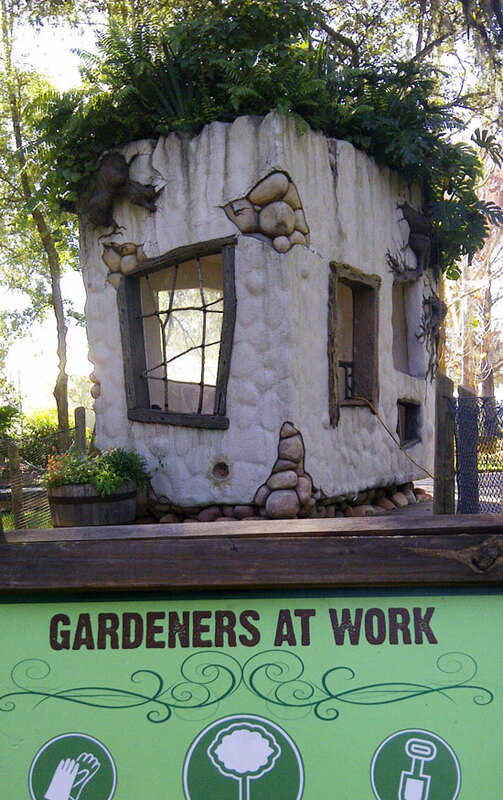 To announce the winners of my gardening giveaway and thank the many people who entered, I'd like to share some very cool DIY gardening ideas that come courtesy of the brilliant staff of the Jacksonville Zoo and Gardens. There's a keyhole garden, a fairy house with a living roof, a vertical cinderblock succulent garden and so many more ideas that promise to defrost your gardening creativity in the coming winter months. I've been sharing my love affair with the Jacksonville Zoo and Gardens for some time now, but after meeting horticultural manager Chris Dailey I've started to appreciate some of the finer details that before went unnoticed. 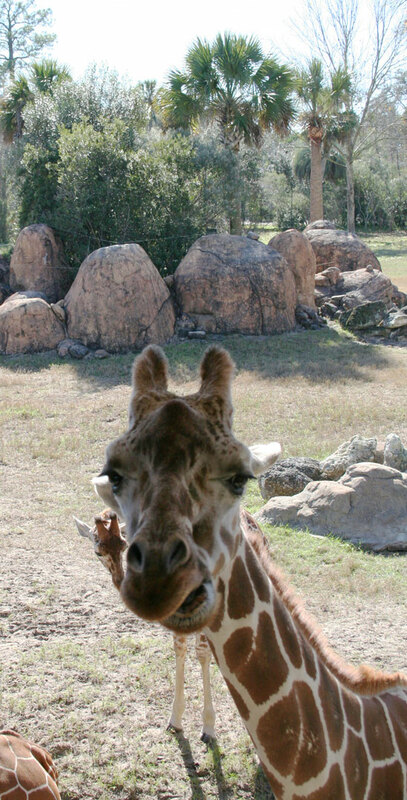 But then again, my distraction is perfectly understandable considering the grand impressions of areas like the Savanna Blooms Garden or the authentic atmosphere of their Range of the Jaguar exhibit. 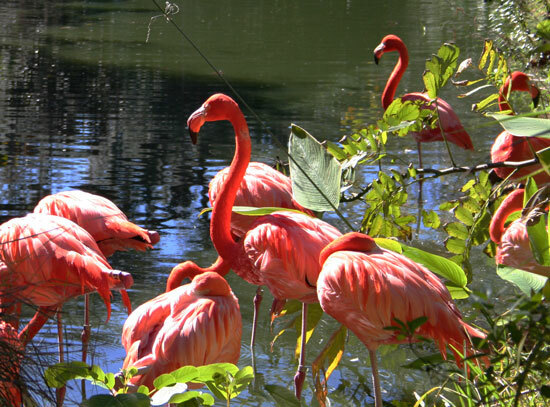 In my opinion, it is the Jacksonville Zoo's supremely designed gardens and exhibits that set them apart from the rest. Surrounded by bromeliads and Latin American blooms in the dappled shade of palms and tropical trees like Jacarandas, it's easy to forget for a moment that you're not in the lush rainforests of the Central American tropics but rather in Northeast Florida, which is just warm enough for them to grow the plants that create the illusion. 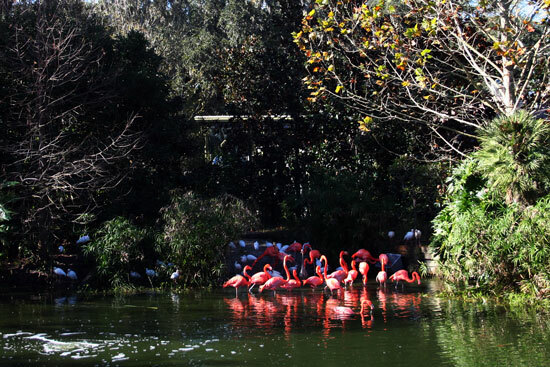 The gardens set the perfect stage for their collection of animals, which can often be seen both at a distance and up close and personal with few obstructions to interrupt your animal encounter. 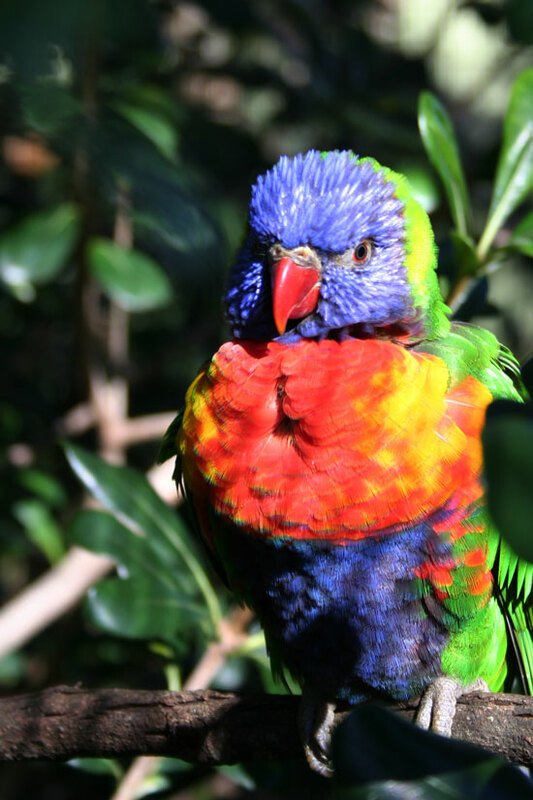 Giraffes and lorikeets take food right from your hand, and stingrays gently glide across the water to give 'high fives' to delighted kids. Of course, the experience is made even more authentic when the environment is right. 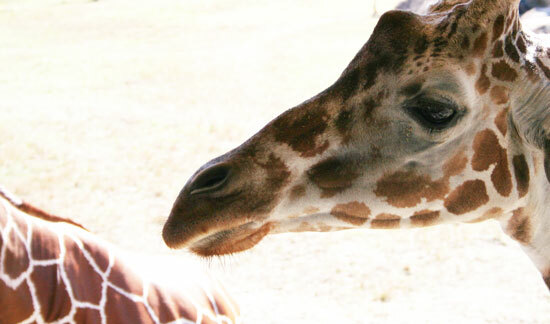 If you want to feed the giraffes, you're enticed to travel through an African grassland with succulent planted rocky outcrops rising from a sea of feathery grasses and flower stalks. And eventually, like me, you'll discover the humble and authentic details that went unnoticed like the supporting cast that makes the stars shine; dutifully recreated African keyhole gardens made from recycled concrete, a ticket booth made to look like a fairy house with the addition of a living roof, and a sign with letters made up of twisting grapevine. You say to yourself: "I can do that!" 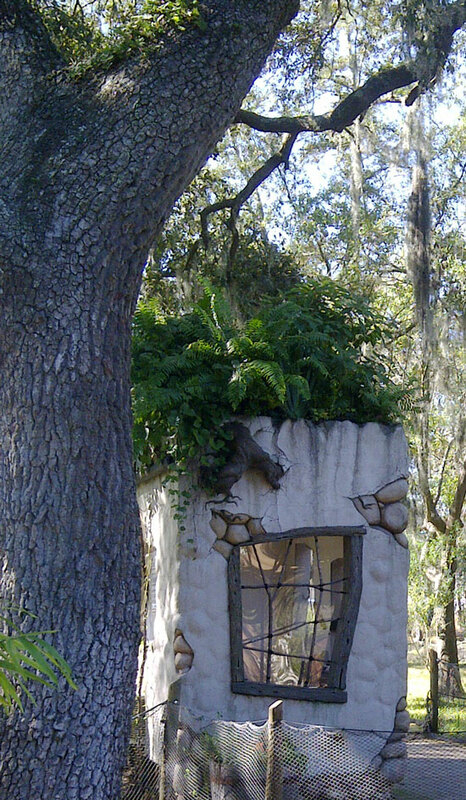 The fairy themed butterfly garden exhibit has ended for the season, but little reminders of its magic spring up in the form of hypertufa mushrooms and this fairy house with a lushly planted living roof. If you're thinking what I'm thinking, this would be the icing on the cake for a kid's clubhouse or a garden shed. Only incorporate a green roof like this one if the structure is strong enough to support the growing plants and moist soil. Line the bed with pond liner to prevent a leaky ceiling, and leave small openings on the bottom of the bed's edge so that water to drain away. While keyhole gardens aren't necessarily African in origin, organizations like www.sendacow.org have revived a permaculture tradition and put it to use fighting malnourishment in African countries like Lesotho. It's a brilliant, yet simple concept: The basket in the center collects compost and holds moisture, thus keeping the surrounding garden bed fed and watered. 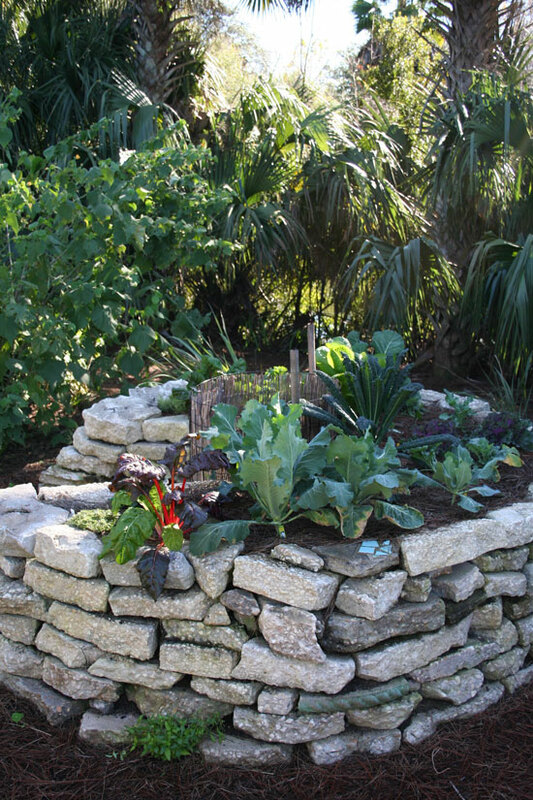 The horticulture team gave us a sustainable double whammy by building the walls with reclaimed concrete! 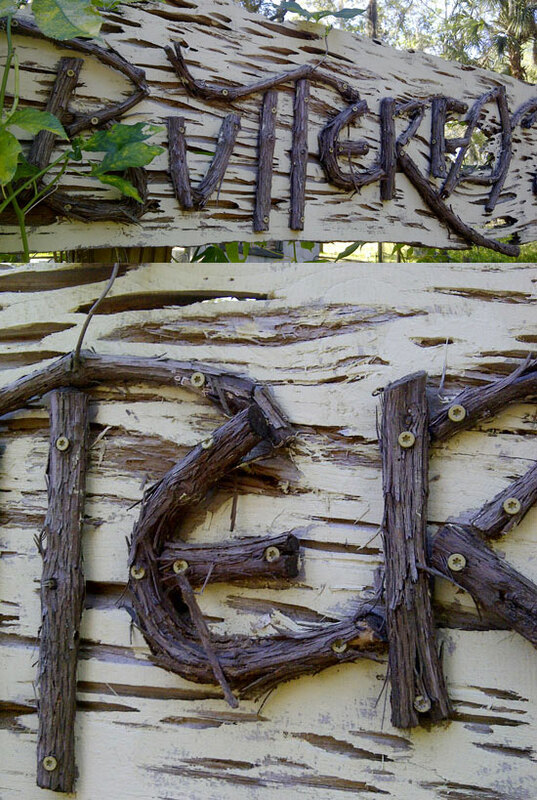 Whimsical grapevine letters set the perfect tone for the Butterfly Hollow exhibit earlier this year. (The rooftop garden was also at the entrance) Here's how to make your own: Just plan out your design on a piece of paper, lightly sketch out your design on a board of wood, and harvest lengths of vine that are just limber enough to be bent when wet. Hold each segment of vine against the outline, cut to the proper length and secure in place with wood screws. In keeping with the authentic design of the Asian Bamboo Gardens, the horticultural staff and Terra Design Studios included little details such as this 'window' through a hedge of Podocarpus that allows a framed view of the bridge and Orchid Pavillion. There are lots of ways to open up framed views in your garden, but if pruning a hedge like this one, they should be set widely apart so that they have room to grow. A window like this takes years of training and careful pruning, so don't expect overnight results. 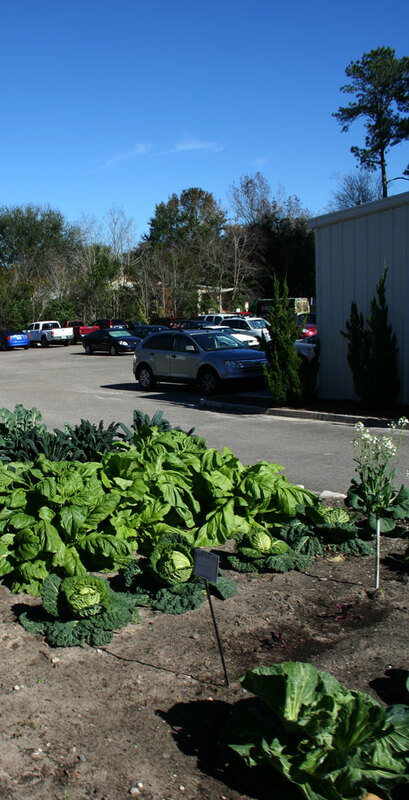 I don't know I was surprised that a cutting-edge zoo like the Jacksonville Zoo and Gardens grew their own vegetables, but while taking the train tour I have to admit that I was blown away. Even if your workplace doesn't have room for a miniature farm like this one, I'm sure that many of you could put this idea to use as a 'team-building exercise' and spend your lunch break harvesting your own lunch. 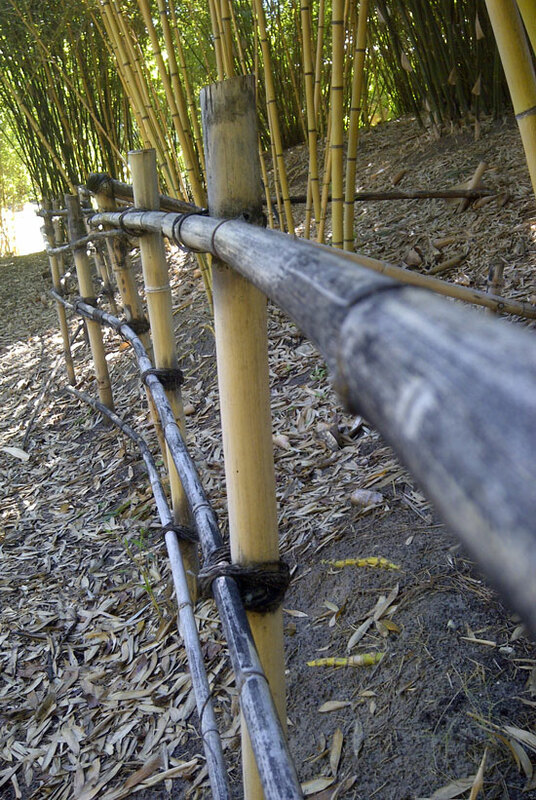 Need to find a use for that thicket of bamboo on your property? The Jacksonville Zoo used it to great effect as a fence in their Bamboo Mist Forest. 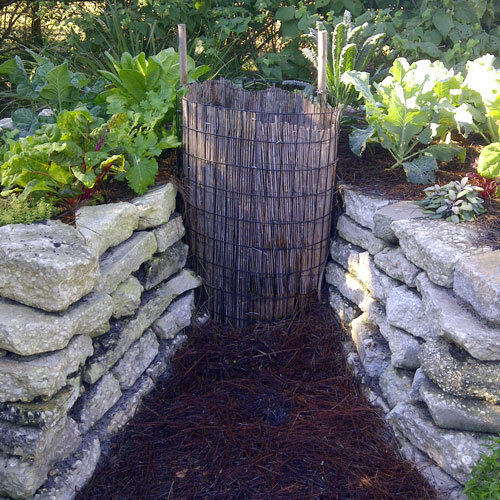 By drilling holes at even lengths and lashing them together with a strong twine, you can make a charming and whimsical fence for your vegetable garden, Asian themed garden or compost heap. 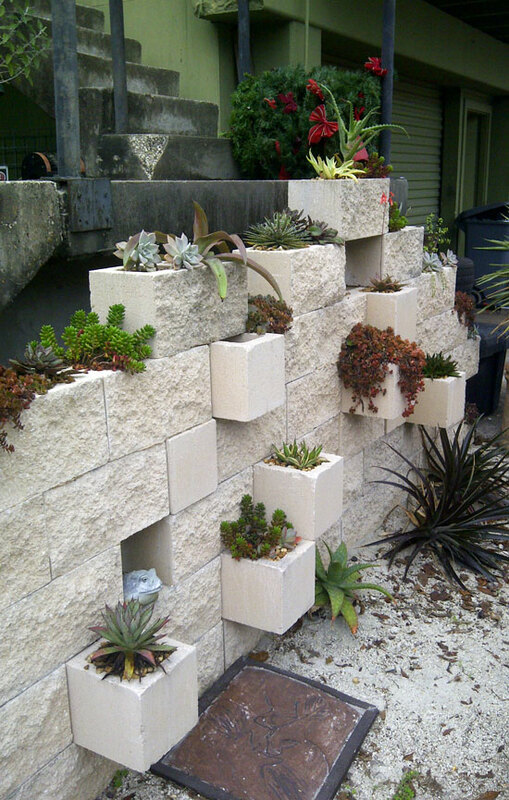 You may have seen these cinderblock vertical succulent gardens on Facebook or Pinterest lately, but I'm not sure I've seen one as nicely done as this. You're not likely to find this feature in the zoo since it's tucked away in the horticulture staff's secret lair, but I just had to share. If you're attempting this project yourself, use poured concrete and rebar well into the ground to prevent your wall from toppling over. Use construction adhesive to help adhere the blocks together. 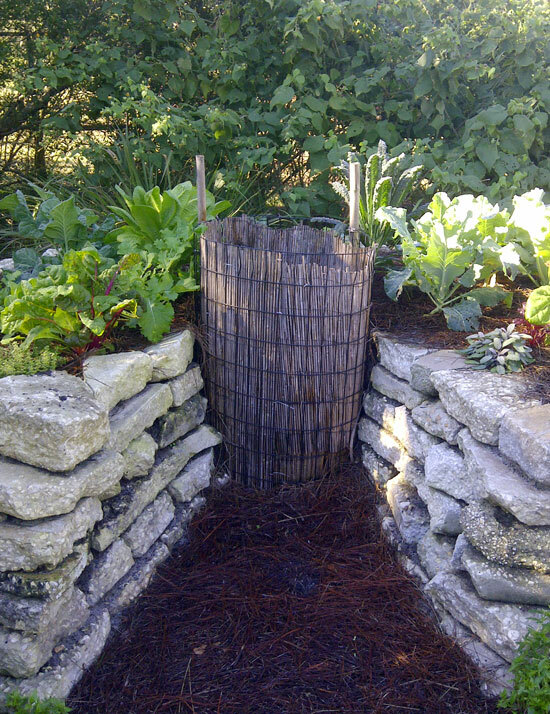 To keep soil from spilling out of the openings, line the bottom with mesh and adhere with construction adhesive. Finally, Announcing the Winners of the Gardening Giveaway! If you're one of the fantastic four that I named, email your address to me at steve_asbell@yahoo.com so that the generous contributors and I can have these goodies sent out to you after the holiday rush. Thank you all for entering and sharing the contest! With over 70 entries, I think that it's safe to say that the donors of all these gardening gifts deserve a hand too. Stand up and take a bow! Yay! I can't believe I won something! Thank you Steve and thanks to the other contributors as well! Beautiful post, and I love some of your design suggestions! Congrats to the winners of your contest! Sounds like a wonderful place! I can see why you love it! 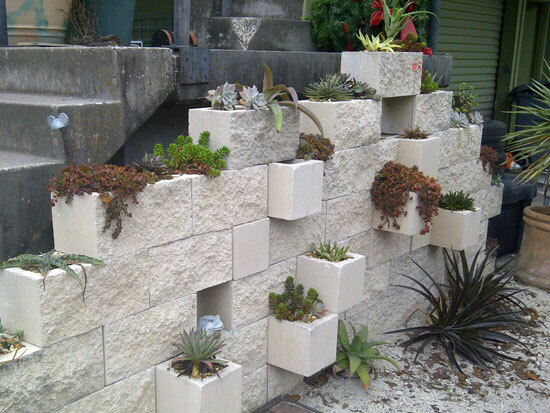 I especially like that cinder block wall. Merry Christmas and Happy New Year from your gardening friend in Houston. Thank you so much for the prize package...I'm thrilled! Happy New Year! Very nice and awesomely written article and great content shared. thanks!